in the classic client/server- as well as the internet-architekture. We are experts in the area of Oracle database technology and development tools and PL/SQL programming. Our project experience with Oracle products reaches back to version 7.0 (1994). 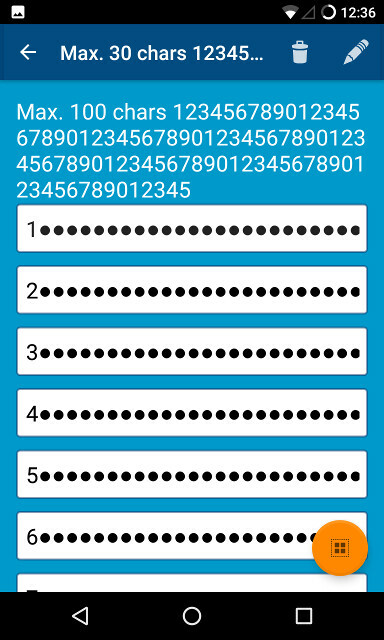 with SQLite, REST, Bluetooth, Near Field Communication (NFC) and AES data encryption. According to surveys, most German companies are sceptical in following the trend to relocate their IT services to countries with cheap labour. We strongly support this view, and therefore offer fixed price services in our core business areas that no offshore business can undercut. We operate quickly, competently and efficiently with a small team of top-class experts in Germany. We think that a software project is realized most efficiently with the smallest possible team of outstanding and highly motivated specialists. Our highly qualified developers, equipped with the correct tools, are not only considerably faster, but also make fewer mistakes than average. Instead of testing the bugs out we try to develop without errors. On balance, this process is notably more efficient, faster and cheaper than trying to minimize labour costs. 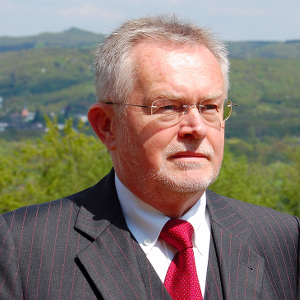 The company was founded in 1987 by Dr Jan Golka under the name »Technische Informationssysteme«. Since 1998, the company has existed in its current form. A branch near Bonn was established in 2005. Dr Jan Golka is the Managing Director and proprietor of Data Design & Management GmbH and is, at the same time, chief developer and consultant. Our core competence lies in developing database-based information systems based on the products from Oracle. We possess a wide and consolidated technical knowledge in the area of Oracle database technology and development tools. Our project experience with Oracle products reaches back to version 7.0 (1994) and to the design tool "Oracle CASE Dictionary 5.1". Since then, we have practically worked on all Oracle Server versions on Unix and Windows platforms. We know and use the latest features of Oracle as well as their add-on products such as APEX, ORDS, XML DB etc. For a Database system, the data model is decisive. There are no possible tuning actions that are able to turn a bad data model into a high performance application. Natural keys, falsely defined attributes as well as missing references will, in the long-term, make the database a data cemetery. The state-of-the-art in the world of Oracle is to fully integrate the application business logic in the database. The means thereto is the Oracle programming language PL/SQL. With this, we realise very large and complex application systems. Any part which we cannot realize with PL/SQL is preferably developed as Java stored procedures or in C with embedded SQL. A solid system architecture is the basis for a robust software application. In our database systems, the database application logic implementation is only controlled with Oracle Scheduler or from internal or external events. The architectural foundation of our mobile systems is REST. All standard operating systems and tools as well as a number of legacy platforms, e.g. DEC VAX/VMS. Plant engineering and construction • Automobile and sub-contractor industries • Construction industry • Electrical industry • Manufacturing systems engineering and tool making • Public administration • Postal services •Software and system houses • Telecommunications provider • Insurance. For the last few years, we have worked mainly for the logistics industry, specifically for the businesses and business sectors of the Deutschen Post AG (DHL). For the industrial engineering of parcels logistics, we are concerned with the realization of the system to supply the production equipment with the relevant data. There, at the same time, we were also consultatively active and accompany long-term large development projects. We have conceived and realized an Oracle-based system for the storage and administration of production data for the Deutsche Post AG (DHL). The system receives data daily from the data suppliers (remote Oracle instances), which are transformed and extended to subsequently generate complex XML mass data. This latter data is then distributed to the production systems. The system has an intranet user interface that was realized with Oracle Application Express. Oracle 11 Rel. 2 was used as the database platform. The complete application logic was programmed using only PL/SQL and Java. One special feature of the system is that it deals with an application close to production. Since production start, the system has run practically maintenance free. In the framework of a very long consulting assignment for the Deutsche Post AG (DHL), we have accompanied the proposal, piloting and introduction of the IT-part of an OCR and video coding systems for parcel distribution equipment. A concept for a comprehensive system architecture was created along with the supervision of the internal and external interfaces. Also, a quality-monitoring database system was implemented in PL/SQL und Java/Swing. We develop native Applications for the Android platform with SQLite, Bloetooth, Near Field Communication (NFC) and AES data encryption. Our special emphasis is on the functionality: our Apps should be easy to handle. Our interests focus on the database access via REST, home automation, sensors and geodata. We develop our apps with Java using Android Studio or Eclipse. Identity theft in mobile devices is becoming more common nowadays. Experts for pickpocketing suggest that the personal information stored in the phone is usually more valuable than the phone itself. But not to store the personal information in the smartphone is not really an option anymore. Have you ever stood in front of an ATM having a hard time to remember your PIN? Do you know the feeling of panic after having entered the wrong PIN of your rarely used credit card for the second time, while in a foreign country far away from home? Then Skrytka is the right app for you! With Skrytka, issues like that are of the past. "Skrytka" is a Polish word meaning "hideout". This app has only one purpose: to safely store your data and to display them to you safely when required. By default, Skrytka hides your data. Only the first and last character of each item are shown open. To see the unprotected entry in full length, touch the corresponding field. The plain text is displayed as long as you touch the field. It is also possible to show all entries on the page in plain text, but this option has be actively chosen. 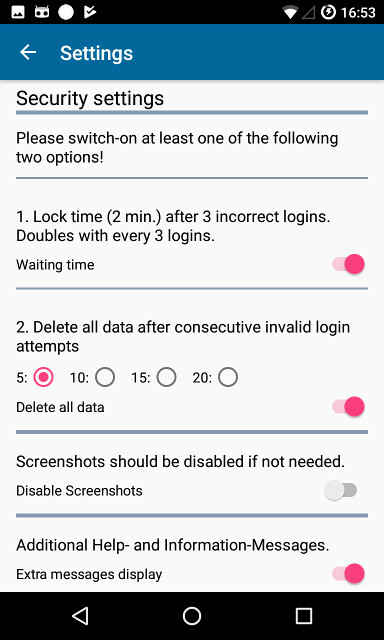 It is a straight-forward no-nonsense app with only four working screens: data entry, data display, data modification, data delete. •256-bit AES encryption of data and credentials (AES "Advanced Encryption Standard"). 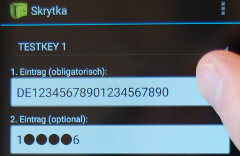 Your Skrytka credentials are kept in the system only as a so-called "digest" and can not be deciphered. •Automatic deletion of data (credentials and data) after 5, 10, 15 or 20 consecutive invalid login attempts. •After three consecutive login failures, there is a waiting period, which begins at two minutes and is then successively doubled up to one day. •Lock screen, the "Home"- and "Recent Apps"-keys stop the App. We would like to discuss with you your problems and assignments, not our daily and hourly wage rates. In our opinion that an experienced software developer and consultant must be capable of implementing a well formulated assignment in a detailed fixed priced proposal. Should this fail, then the assignment must be broken down into manageable parts, or we would compile a detailed concept or specification, preferably for a fixed price for you. We offer our support for the whole development process, from concept via realization to launch and maintenance of your complete system. In our core business areas we offer high quality services at very favourable fixed price rates. Android is the system platform not only for mobile devices but for mobile information systems in general ("Home Automation", "Internet of Things"). We design and develop for you nativ Android Apps in Java with the use of the Android Studio. We work with Bluetooth SPP (Serial Port Protocol), NFC, sensors, Google Maps, SQLite, AES data encription, HTTP und REST. Data security is particularly important, not least because some apps - most notably the social media apps - are secretly sniffing the smartphone data. Our App "Skrytka" is an example of reasonable data protection. M. Sc. (Physics) and Ph.D. (theoretical Physics). IT experience since 1972. Active as software engineer, software architect, project manager and IT consultant since 1984. The contents of this website were written with due diligence and by the author&apos;s best knowledge. We can be held liable only by general laws, especially for our own contents acc. § 7 TMG (German law on tele-media) and for external contents acc. §§ 8 to 10 TMG. All content of this website, especially texts, pictures, images, graphical presentations, music, trademarks, brands and so forth, are subject to copyright laws. Contents of external websites on which we are linking direct or indirect (through »hyperlinks«) are beyond our responsibility and are not adopted as our own content.